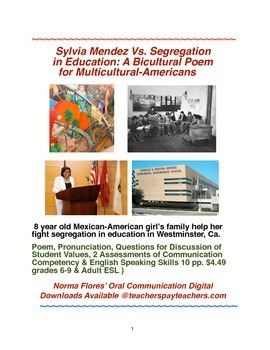 “ Sylvia Mendez Vs. Segregation in Education: A Bicultural Poem for Multicultural-Americans,” by Norma Landa Flores, M.A. Speech Communication, was written for @teacherspayteachers.com in keeping with the author’s commitment to integrating educational institutions and empowering marginalized multicultural people to speak up for their rights. 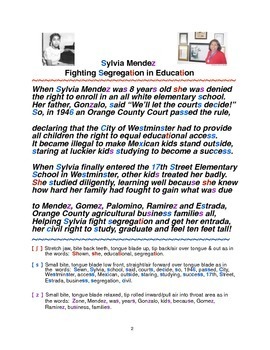 Page 2 is the Poem, “Sylvia Mendez Fighting Segregation in Education.” At the bottom of page 2 instructions for pronouncing 3 consonants found in the poem, are provided. They are [ ʃ ] as in Shown, [ s ] as in Sewn & [ z ] as in Zone. Page 3 is the Multiple Choice Questions for Discussion Including Student’s Values form. It features 3 multiple choice questions about information given in the poem and allows spaces for students to discuss what their beliefs, values or attitudes are about their answers, given the topic. Page 4 is the assessment page that has sentences featuring the 3 consonants, [ ʃ ] as in Shown, [ s ] as in Sewn & [ z ] as in Zone, which students take turns reading a loud and assessing each other’s appropriate pronunciation with. Page 5 is the ACCESS, Assessment of Communication Competence and English speaking Skills form. Students read the sentences a second time and evaluate themselves on the observable communication behaviors of : eye contact, audibility, pronunciation, grammar, emphasis & communication of message function & intention. Page 5 is the Contexts & Standards-Based Criteria used for Assessing & Contrasting the [ ʃ ] as in Shown, [ s ] as in Sewn & [ z ] as in Zone sounds. Pages 7-10 is the Appendix with Suggestions for the Teacher/Facilitator including (1) Five suggestions for communicating about the poem (2) Four suggestions for conducting the Consonant Articulation/Pronunciation Assessments (3) the teacher/author’s rational for preparing this multicultural lesson. All in all, the poem serves as an example of how the segregated, marginalized Mexican American Families in Westminster, led by the Mendez family, proved that “Separate is not Equal,” when it comes to education. It also showed that perseverance and community cooperation can help today’s teachers, teacher’s aides, parents and community leaders promote dialogues and discussions with educational decision making administrators and school boards to more effectively and respectfully meet their community’s educational needs because, all students have the right to not be segregated or turned away from their Mainstream American Schools, period!